The Indian Navy plans to go green by setting up a mega OTEC plant to power its base in the ecologically sensitive Andaman & Nicobar Islands. The project aim is to generate 20 MW of power for the naval facilities and the air base on the island. 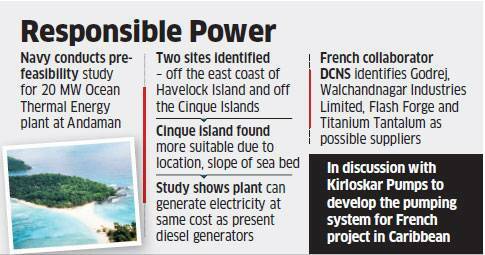 DCNS, French industrial group that specialises in naval defence and energy, has performed and presented a pre-feasibility study to the Indian Navy for deploying offshore OTEC plants at Andaman Island. DCNS, who is also building the Indian Navy’s Scorpene submarines, has identified two possible locations near Port Blair for the project. 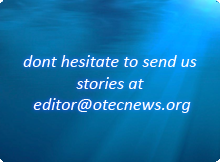 The OTEC plant could result in completely stopping the current use of diesel-based sources and rely on clean and sustainable energy for naval operations. The Indian Navy is keen on green energy and had displayed a scale model of the OTEC plant at a recent reception at Navy Chief Admiral RK Dhowan’s house, which was also showcased to Prime Minister Narendra Modi.